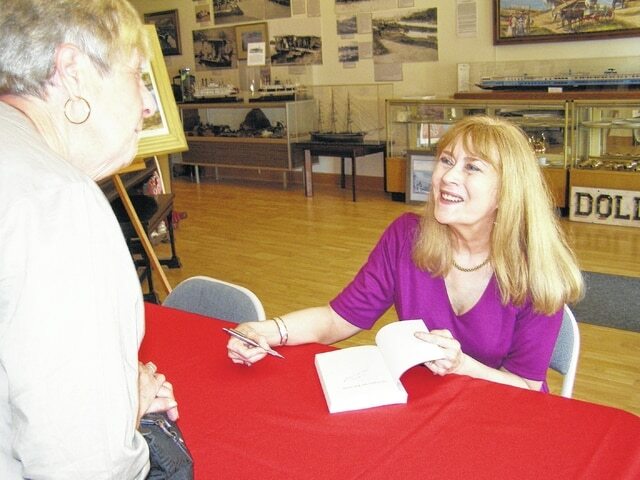 Local author Carlene Thompson signs copies of her newest book “Can’t Find My Way Home” on Saturday at the Point Pleasant River Museum and Learning Center. POINT PLEASANT — Local author Carlene Thompson had her 16th book published earlier this year. Thompson said she became interested in writing at a young age and was first intrigued by mysteries in the movies. “I have been interested in writing since I was in grade school. I loved mysteries. I first saw the movie 101 Dalmatians, which was a mystery about dogs being kidnapped, and I decided I was going to write books like that,” she said. Publishing a book takes time. Thompson said there is a process every author has to go through to get his or her work published. Before publishing her first novel, “Black for Remembrance,” Thompson said she wrote for the joy of it. Then decided to send a short story to a literary magazine where a publishing agent took interest in her work. Thompson said having her book “sold at the auction” meant a publishing house had taken interest in the book and was willing to publish it. Thompson said she was surprised by the fan base her books brought and the surreal feeling of seeing her own work in print. Thompson grew up in Point Pleasant, and said she is glad to do book signings in her hometown. Thompson, who has an international fan base for her novels, met with fans from the Bend Area, some of whom knew her or her relatives personally. One fan, Lauretta Jackson, has made it a tradition to attend Thompson’s book signings and says she loves the author’s work. Thompson said she likes to write what she knows about, meaning many of her stories, though the plots are fictional, have settings in or resembling the region around the Ohio River. Thompson said she is already writing her next book, but adds that it could be some time before the it is published.